Great site!! Love the title! 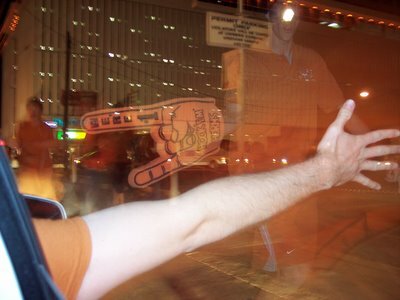 I love the picture of the big hand making the longhorn sign (since we all know what that means in Italy). I about fell off of my chair one day when the Italian news showed Mrs. Bush flashing the long horn sign as the Texas University Band marched pass her. My husband couldn't believe his eyes! Too funny. At least the newsman was nice enough to explain what it means in America so the Italians didn't think she was flipping everyone off! Welcome to the world of blogs! Can't wait to read more. Hey, you should come over t Blighty and see our soccer fans lose it with with 5+ pints of beer inside them! I found your blog via your comment on Scruffy American. Must say, I love this post!